Tom Lillycrop faces a spell on the sidelines with a dislocated shoulder. Batley Bulldogs have suffered a major injury blow ahead of the new Betfred Championship season with prop forward Tom Lillycrop facing a lengthy spell on the sidelines. Lillycrop celebrated signing a contract extension last week, which will keep him at Mount Pleasant until the end of 2019, but he suffered a dislocated shoulder in last Sunday’s 28-0 pre-season victory over Keighley Cougars. 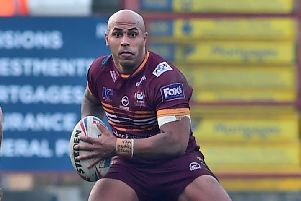 Lillycrop has started 23 times for Batley and made a further 62 appearances from the bench during the last three seasons but he now looks set to miss a large chunk of the forthcoming campaign. Coach Matt Diskin revealed: “He is getting a scan this week, but he could be out long-term, which is not great news. “He was one of our best players last year before his season got cut short by injury. “He has dislocated the other shoulder to the one he did last year, but he is having a bad run of luck. Batley registered a third straight win of pre-season as an impressive defensive display helped nil the Cougars in atrocious weather conditions last week. Diskin hailed his side’s efforts, adding: “It was terrible conditions so it wasn’t the most flamboyant game, but defensively we were very good. Batley ran in five tries against Keighley, from Joe Chandler, Tom Hemingway, Jason Crookes, James Davey and Dave Scott but Diskin believes there is room for improvement. He added: “Our defence is looking really sharp at the moment, but we want to move our attack on a bit. Batley travel to Doncaster on Sunday (3pm) for their fourth and final pre-season game and the last two matches will be good preparation for the Bulldogs, who face three consecutive away games at the start of the season. Doncaster should provide Batley with a decent final work-out after they pushed London Broncos close before going down 22-16 in their opening pre-season fixture at the Keepmoat Stadium last week.